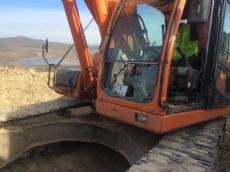 On Jan. 12 at 11:20 and 11:40 (GMT+4) units of the Armenian armed forces opened fire at an excavator which was driven by a civilian and engaged in engineering work at a border point near Kamarli village of Azerbaijan’s Gazakh district, Trend reports referring to the Azerbaijani State Border Service. As a result, six bullets hit the ladle and other parts of the excavator, damaged the glass of the cab. There are no human casualties. Earlier, the Armenian armed forces opened sniper fire at an excavator on Jan. 6 at 15:35 (GMT+4) at a border point near Kamarli village of Azerbaijan’s Gazakh region. The excavator was operated by a civilian, in 450 meters from the state border. The bullets hit the excavator, the civilian was not injured.